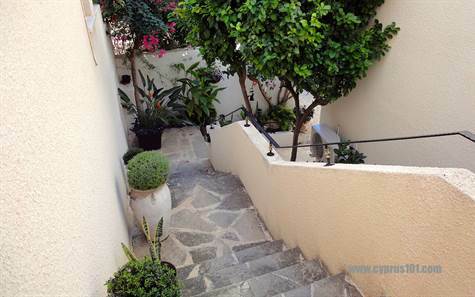 Chloraka Village, Paphos - Walking down the entrance steps to this delightful property, you immediately have the sense and feeling of peace and tranquility. The current owners have certainly created their own little paradise, with an immaculately presented home and wonderful outdoor space. The property is detached with quality modern finishes throughout. The living room is spacious and light with windows on two sides providing easy access to the beautifully landscaped gardens. The design is open plan with a comfortable lounge and dining area. An attractive archway leads to a newly fitted kitchen, well equipped with built-in oven and microwave, electric hob, extractor fan and fridge/freezer. The washing machine is housed in an external utility room. To the right of the entrance are built-in cupboards providing useful storage space. A few steps lead up to two double size bedrooms, both with fitted wardrobes. The master bedroom has an en-suite bathroom with fitted vanity unit, and there is a separate shower room accessed directly from the hallway. The property has landscaped gardens on all sides and is completely private. The neighbour’s garden in front provides a fabulous rural aspect with the sea views beyond. Perfect as a holiday retreat, or as a holiday home, this fully furnished beautiful home is something very special. There are full title deeds. Please refer to MLS#: 1318 when inquiring.